Annual parade participants include a wide-range of civic and not-for-profit organizations, as well as bands and entertainment. 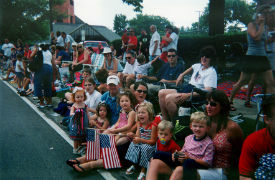 In an effort to highlight the neighborhoods of Downers Grove, the Village extends an invitation to local home owner's associations or other neighborhood groups to participate in the July 4 Parade. Neighborhood entries are encouraged to incorporate a theme that best represents their own unique attributes and may consist of a float or a walking entry. APPLICATIONS will be accepted through JUNE 25.